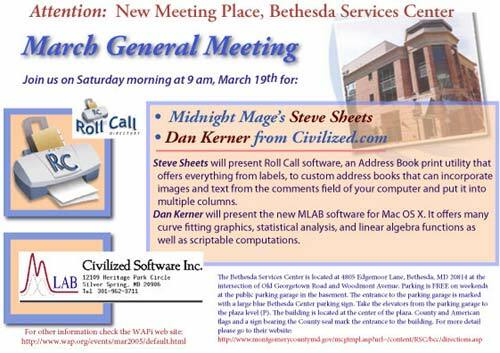 March’s General Meeting was held at a new location in the heart of Bethesda. The Bethesda/Chevy Chase Regional Services Center (BCC-SC) offered spacious free parking in an underground garage and Metro access. Outside of getting lost in the garage, I was left with an overall good impression I think it is a good place to hold future meetings on the “other side of the river.” Stay tuned for more meetings at this potentially regular meeting place. But we didn’t come to check out the new digs, drink free coffee and gobble down the sweet snacks. No, we came for more knowledge about our Macs, the presentation and the freebees! Incidentally the coffee and sweets were brought and set out by Nancy Little, the most stalwart of volunteers, who with her husband Jim, tote in the general meeting supplies, set it all up and then attend to the front desk at every general meeting. Thanks, Nancy and Jim; you are volunteers extraordinaire! This month’s question and answer session was as lively as ever with “how to’s” and reminders passed on by John Barnes and Lawrence Charters. What is your opinion of the Camino Web browser? Camino is a fast, lean Web browser. It conforms to international Web standards, but has been customized to take advantage of Mac technology, particularly on-screen rendering. Firefox is a close cousin, but uses more standard Mozilla code, and developers have written a host of extensions for it. Neither of them currently support Mac OS X’s built-in spell checker, making Safari a better choice for on-line forums such as the Pi’s TCS. All three have their place. An external FireWire hard drive will not unmount. A message says that an application is open even though that is not the case. What may be happening is that some application is putting a temporary file on the external FireWire drive. It is hard to guess what that might be but running Activity Monitor (found in the Utilities folder) might give an indication of what is running and keeping the drive from unmounting. It was suggested the user take the issue on-line to the TCS if the problem continues. I want to replace an inkjet printer but not pay a lot for cartridges. Recommendations? Inkjet printers are cheap because they are being sold below the cost of manufacture; it is the ink cartridges where the manufacturers make their money. A simple answer is to make sure the printer you buy uses a separate black cartridge for black print. Those printers that use a combination of color inks to produce black print will end up needing cartridges replaced more often and cost more in the long run to operate. There are some continuous ink flow systems out there that could end up saving you money if you print on a massive scale. What is your work flow? Do you use a lot of color ink? Another trick you can use to reduce ink consumption is to print in Draft Mode. Finally, there are sources of cheaper ink cartridges on the Web, but buyer beware. I need a PDF browser Plug-In but can’t find it. Abode Reader will automatically install a PDF plug-in. Or you can simply force a download of the PDF file to your computer by holding down the Option key and clicking on the link, then reading the document with Acrobat Reader or Preview. Reading a PDF in a Web browser window is often clunky. How often should you clean up Permissions? Use Disk Utility to repair permissions after doing a system update or installing some software, or whenever your machine crashes or any application is exhibiting strange behavior. There are some utilities out there that will repair permissions automatically but Lawrence felt that it is better to do this interactively rather than have some mindless utility doing such a critical function out of sight. What software should you use to remove obsolete or redundant files and applications? Don’t use a software package per se; just use your mouse and your good judgment. We closed this opening section with some extemporaneous comments by John Barnes. Explaining that he wanted to get an informal feel for Bethesda as a meeting location, John asked if this was the first meeting many had attended within the last two months. Several hands went up. Next, he talked about the high lease costs for the Pi “clubhouse” and said we are searching for a new location. Regarding our recently installed phone answering system, John pointed out that some callers, when confronted by voice recorded messages, hang up. The system has Caller ID capability and we try to reconnect with the caller by phoning them back. However, it is much easier when a message is left because we cannot adequately address an inquiry if we don’t know what prompted the call. Lastly, John made a pitch for nominations to the Board of Directors. He reminded one and all that the deadline for nominations was midnight. MLAB from Civilized Software, Inc.
Dan Kerner, Civilized Software’s founder, along with the company’s President, Gary Knott, gave us a very thorough and somewhat detailed description and demonstration of the MLAB software package. MLAB is a mathematical modeling package, and probably a mathematicians dream, but it was also a little beyond the scope of many of those attending. Not deterred in the slightest, Gary, in an effort to show how MLAB worked, prefaced the operation with a lesson in calculus. Or was it chemistry? Anyway, it was interesting that some of the “lecture” actually made more sense than when I studied the subject a couple of decades ago - a real scary thought. While conducting this preliminary step, Dan took and answered a few thoughtful questions from the audience that gave me a better appreciation of the diversity and depth of some of the Mac users in our group. After the equivalent of an abbreviated college lecture, Dan ran the numbers to show us what MLAB can generate. It is a sophisticated piece of software with a list price is $1495.00. While a little out of my price range, for some companies it could be money well spent to help them get the results and graphic representations they need to better conduct their business. My hat is off to these brilliant minds that can create these complex and sophisticated programs. Nice to know our Macs can be cool to the brainy bunch too! Midnight Mage Software Program Director, Sonny Worrell, introduced the second presentation. She is a lively and likable person and she set the stage by asking if everyone knew what a “mage” was. There must have been some puzzled looks as she explained it was someone who does magic. Now, coupled with the fact that Steve Sheets, the company’s lead programmer, is a true late night person, it only followed that they would name the company Midnight Mage. Clever! Steve, a Mac software programmer since 1983, developed Roll Call Directory (RCD) based on Sonny’s needs. Steve began his demonstration by asking a couple of brief questions regarding audience member’s use of Mac OS X and Address Book. He clarified that Address Book manages contact information and does it very well; however, it does not do printing very well. Thus was born the need for RCD and Steve stressed it is not an editor of your contact lists, but rather is designed to produce a printable directory as well as printable labels and envelopes from your Address Book data. Steve and Sonny conducted a fast paced and enjoyable demonstration of Roll Call Directory. As Steve clicked through various menus and screens, it was evident the program was simple, easy to use and thoughtfully developed. The interface was very Mac OS X-like and easily permits presentation of Address Book information in several different ways. As a label maker, the program did a superb job. It displayed label information and offered many different ways to use the data to create your own labels – including a membership directory, complete with photos. It was impressive how adaptive the software program was and all from what seemed to be a simple set of criteria: the contact information stored in your Address Book. And when the demo was drawing to a close, Steve asked what we thought this program costs. In my head, I guessed $24.95 and was surprised to learn I was $10 too high! Roll Call Directory costs $14.95 and is downloadable from the Web. Lastly, these gracious presenters gave us a copy of the program for the drawing. There were two prizes up for the big drawing, Roll Call Directory and Microsoft Virtual PC 7.0. When John Barnes’ name was first out of the hat, there were a few of catcalls from the audience. John claimed the copy of Roll Call Directory and suggested that Board of Director members may win prizes simply because they attend meetings; maybe this is an incentive for more members to run for positions on the Board. Dave Duncan had the winning ticket for Virtual PC 7.0. Less prominent prizes went to Pi members Ernie Sowada, B C Reynolds, Darrell Miller, Bernie Benson, Doug McNeill, and Gabriel Roth. The meeting ended with everyone pitching in to clean up and reconfigure the room. It was a most pleasant return to Bethesda.